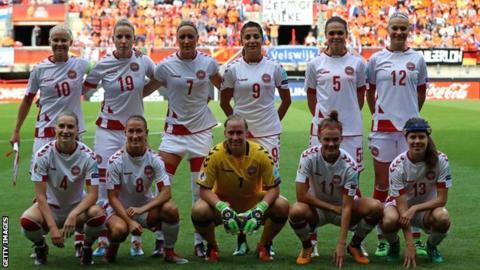 Denmark women will not play Sweden in Friday's World Cup qualifier as the row with the Danish Football Association (DBU) over employment conditions continues. The DBU informed Sweden the game was off on Wednesday morning. The team remain on strike after the DBU rejected two recent proposals. They included an offer of £60,000 a year for the women from the men's team, and to have the same basic rights as the men have in their agreement. The Euro 2017 runners-up, who did not play their friendly against the Netherlands last month because of the dispute, have another World Cup qualifier next Tuesday, against Croatia. Negotiations over the new deal, which are understood to have been ongoing for the past 10 months, are focused on whether the women's national team players are employed by the DBU. In the new deal put forward by the Danish FA, and so far rejected by the players, the women's national team would no longer be classed as employees of the football association.